The VC Series is designed for simple, low cost anchor recovery on smaller boats and rope hauling on larger vessels. An extremely versatile vertical capstan or general purpose electric winch for use as an anchor winch, pot hauler or davit winch. Steel capstan winch, with different drives and recommended for boats up to 38 m (Milos Plus). Possibility of 230V, 400V or hydraulic drive. Stainless steel capstan winch, with different drives and recommended for boats up to 50 m (Milos Plus). Possibility of 24V, 230V, 400V or hydraulic drive. Stainless steel capstan winch, with different drives and recommended for boats up to 50m. Possibility of 24V, 230V, 400V or hydraulic drive. A boat capstan is a vertical winch, electric or hydraulic, designed to tension a mooring line or hawser. Unlike a windlass, it generally has no chain gypsy. On NauticExpo these items are intended for use on recreational craft. These devices are particularly useful on large boats whose displacement and line weight make mooring maneuvers difficult. 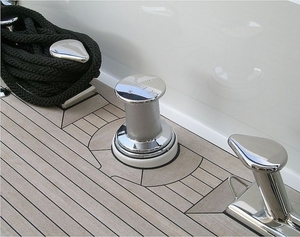 They often are mounted near deck cleats and warping fairleads on yachts. It seems they are also used for landing particularly large game fish. The capstan drum is turned by an electric or hydraulic motor. As with windlasses, capstans can be horizontal or vertical, though the latter, traditional configuration is the most common. The drive unit is usually mounted below deck, beneath the drum. Size and power vary with the needs of vessels of different dimensions.